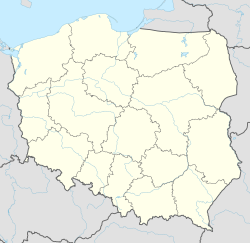 Sierpc [ɕerpt͡s] (German: Sichelberg) is a town in Poland, in the north-west part of the Masovian Voivodeship, about 125 km northwest of Warsaw. It is the capital of Sierpc County. Its population is 18,777 (2004). It is located near the national road No 10, which connects Warsaw and Toruń. Sierpc is a rail junction of local importance, where two lines cross: Kutno - Brodnica, and Nasielsk - Toruń. It is an open-air museum and is located in the suburbs of Sierpc in the valley of the Sierpienica River and its confluence with the Skrwa Prawa. Though it looks like a separate and independent village because of its great area (about 60.5 hectares) and because it is fenced, the museum is included within the town's borders. The village is made up of 11 farms (houses - cabins, barns, cowsheds, granaries, pigsties), an inn, a blacksmith's workshop, an oil - mill, a windmill, a manor house, a small chapel and a wooden church. Everything was collected from different regions of Masovia. The architecture of houses reminds that from 19th or early 20th century. Also inside the houses there are pieces of furniture, utensils, equipment and hand-made decorations which are appropriate to the epoch. Each season there are exhibitions devoted to traditional Masovian customs i.e. "Christmas in Mazovie Region", "Easter in Mazovie Region". Also children can find something interesting for them : "Palm Sunday in Skansen museum", "Sunday in Skansen museum", "Cooking in the middle of the glade", "Children's Day in Skansen museum", "Honey harvest in Skansen museum" or "Harvest season in Skansen museum". A few movies have used the museum as a location. The most famous are: Pan Tadeusz, Ogniem i mieczem and Szwadron. The church was built in the 16th century. At the beginning it was a chapel near a hospital. The church was built in the Gothic style and later rebuilt in Baroque style. A fire in 17th century destroyed the church completely and after second rebuilt it lost its original form. The most valuable relic, not only of church but of the town are pieces of paintings from the Middle Ages and a sculpture from the 16th century "Generosity's Throne" made by the pupils of Veit Stoss. Now it's in main altar. The manor house was built at the turn of the 17th and 18th century and, undoubtedly, it is one of the most important monuments in the Sierpc area and the oldest architectonic laic object in the town. It is a timber house with a thatched roof. There are plenty of mysterious legends and stories about "Kasztelanka" and the adjoining Benedictine monastery which is connected to it via a corridor. The monastery is more massive and solid, indicating it may have had a defensive purpose, perhaps against a Swedish attack. Wikimedia Commons has media related to Sierpc. This page was last edited on 26 December 2018, at 21:08 (UTC).